d i v e r s i t y w o m a n . c o m Fa l l 2 0 1 8 D I V E R S I T Y W O M A N 21 Fresh Insight E very generation fought for equality in its own way, and millennials are no different. Shenetha, a baby boomer, watched her mother work for the St. Louis City water division for over 30 years until she retired. Despite her mother coming Kendra Elaine Millennials are carving out their own path in the fight for gender equality. 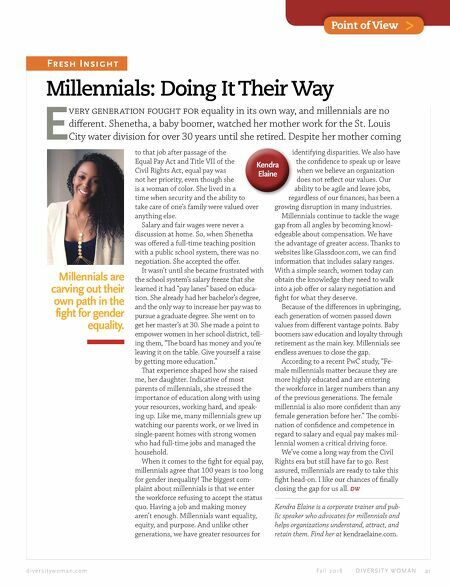 Millennials: Doing It Their Way Point of View > to that job after passage of the Equal Pay Act and Title VII of the Civil Rights Act, equal pay was not her priority, even though she is a woman of color. She lived in a time when security and the ability to take care of one's family were valued over anything else. Salary and fair wages were never a discussion at home. So, when Shenetha was offered a full-time teaching position with a public school system, there was no negotiation. She accepted the offer. It wasn't until she became frustrated with the school system's salary freeze that she learned it had "pay lanes" based on educa- tion. She already had her bachelor's degree, and the only way to increase her pay was to pursue a graduate degree. She went on to get her master's at 30. She made a point to empower women in her school district, tell- ing them, "e board has money and you're leaving it on the table. Give yourself a raise by getting more education." at experience shaped how she raised me, her daughter. Indicative of most parents of millennials, she stressed the importance of education along with using your resources, working hard, and speak- ing up. Like me, many millennials grew up watching our parents work, or we lived in single-parent homes with strong women who had full-time jobs and managed the household. When it comes to the fight for equal pay, millennials agree that 100 years is too long for gender inequality! e biggest com- plaint about millennials is that we enter the workforce refusing to accept the status quo. Having a job and making money aren't enough. Millennials want equality, equity, and purpose. And unlike other generations, we have greater resources for identifying disparities. We also have the confidence to speak up or leave when we believe an organization does not reflect our values. Our ability to be agile and leave jobs, regardless of our finances, has been a growing disruption in many industries. Millennials continue to tackle the wage gap from all angles by becoming knowl- edgeable about compensation. We have the advantage of greater access. anks to websites like Glassdoor.com, we can find information that includes salary ranges. With a simple search, women today can obtain the knowledge they need to walk into a job offer or salary negotiation and fight for what they deserve. Because of the differences in upbringing, each generation of women passed down values from different vantage points. Baby boomers saw education and loyalty through retirement as the main key. Millennials see endless avenues to close the gap. According to a recent PwC study, "Fe- male millennials matter because they are more highly educated and are entering the workforce in larger numbers than any of the previous generations. e female millennial is also more confident than any female generation before her." 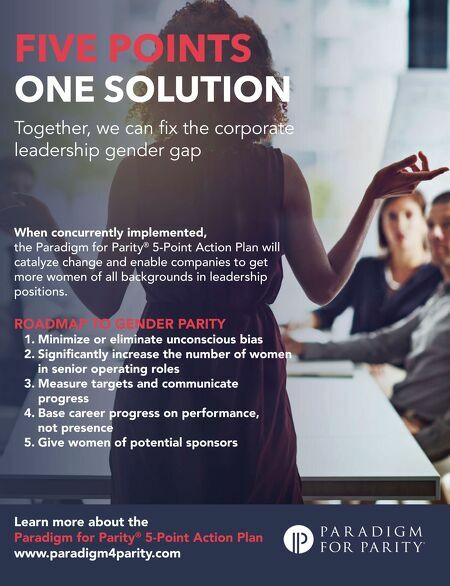 e combi- nation of confidence and competence in regard to salary and equal pay makes mil- lennial women a critical driving force. We've come a long way from the Civil Rights era but still have far to go. Rest assured, millennials are ready to take this fight head-on. I like our chances of finally closing the gap for us all. DW Kendra Elaine is a corporate trainer and pub- lic speaker who advocates for millennials and helps organizations understand, attract, and retain them. Find her at kendraelaine.com.